XPERF is a great Windows diagnostics tool! We were seeing the above SQL Server alerts with increasing frequency… a week ago we’d get 1 or 2 a day, and yesterday we were seeing spikes of up to 10 an hour. CPU status in PerfMon showed nothing out of the ordinary. CPU stats in Resource Monitor showed an interesting cascade type pattern where all the CPU’s (24 on this machine) would spike to 80% then slowly fade back to 0. CPU0 on Node 1 however showed a more steady spike to 80% then back to 0% pattern. 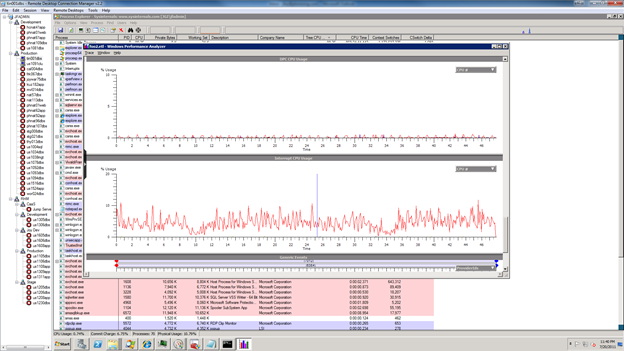 In the interests of finding out what was on CPU0 on Node 1, I downloaded PE (Process Explorer). PE showed me nothing that could be tied to a single core, but I did notice that the Process Interrupts CPU Time was about 2/3rds greater than the System Idle Process. I couldn’t glean any additional information from PE, so I downloaded XPERF, a Microsoft tool to dig into kernel performance. There I could see that CPU 12 (CPU 0 on Node 1) displayed a regular spike to 100% and back to 0%. Xperf foo.etl to see the results. 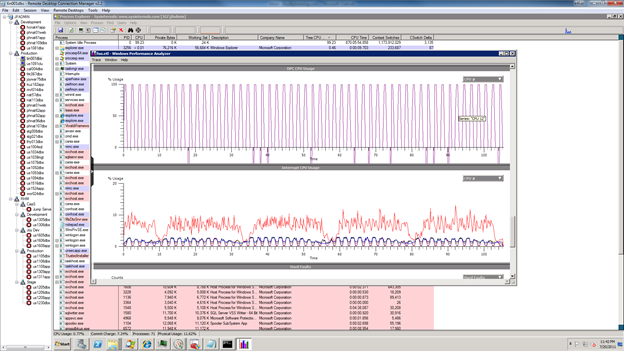 Below is a before and after of the DPC CPU Usage. The differences are night and day. XPERF can be installed as part of the Windows SDK packaging. Make sure you select the Developer Tools, and then you can find the msi’s for the xperf under the installation directory.